3/18/2008Share this story on Facebook! Look for leads everywhere: Talk to your friends, teachers, family members, and past employers and let them know what kind of internships and opportunities you’re looking for. Reach out to professional organizations and associations related to your future career. Explore Career Services resources to find job and internship fairs, workshops, and other campus/ off-site events. You can even contact Ithaca College alumni through the IC Alumni Online Community. Polish your pitch: The art of schmoozing takes practice. Take the opportunity to practice on friends, family, school counselors, and other people you know well before you reach out to complete strangers. Do your homework: Conduct research on the person or company you will be contacting. Think about questions you will ask ahead of time, but be prepared to improvise. Be specific and respectful of the person’s time: Ask thoughtful questions and probe for advice on career-related topics. For example, "What should I do to prepare for this field?" Though your ultimate goal may be to score a job or internship, networking is first -- and most importantly -- about forming professional relationships. Follow up: Be sure to keep in touch with your professional contacts. One tactic is to send individualized "update" e-mails with information relevant to your contact (just not too often). For example, "I just read that your company is celebrating its 40th anniversary..." Ask for referrals to other contacts and networking opportunities. Don't give up: Your first few networking attempts might not turn into real opportunities, but there will never be a shortage of valuable resources and people to network with! No, I didn’t work for NASA this summer; I was an intern in the corporate outreach department at the A&E Television Network (AETN) in New York City. After hearing horror stories of interns slavishly running personal errands, making endless copies, and answering ever-ringing phones, I admit that I had braced myself for a summer of grunt work. But even though my title was intern, I found myself doing actual work, including researching facts for a poster about the history of bowling, fact-checking a quiz for the Naked Archeologist, and developing and designing study guides to be used in history classrooms. And I only had to get coffee (okay, tea) for my boss once. 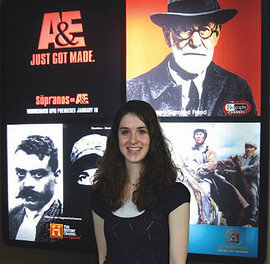 At AETN, corporate outreach staff create and implement educational programs in communities served by the networks, with most projects relating to A&E, the History Channel, and the Biography Channel. For example, the department is knee deep in the Take a Veteran to School Day project, which launched this fall. When I first got the internship offer I was hesitant to join the corporate outreach department, as it was not directly related to my television-radio major. But once I began work, I realized that researching, writing, and copyediting are essential skills for anyone studying communication. Working on study guides (on subjects ranging from the Aztec people to the history of the computer) sharpened my analytical skills and got me excited about the possibilities of relating documentary filmmaking to education and to world travel, too. The perk: watching the History Channel programming throughout the workday! In all, I wrote close to 20 study guides -- including guides for the entire Engineering an Empire series -- adding to the department’s collection to be used in middle and high school classrooms in conjunction with AETN documentaries (see video below). Now, at the beginning of my sophomore year at IC, middle school and high school educators all over the country (and maybe beyond) are including in their classrooms the summaries, vocabulary, discussion questions, and project ideas I created. It’s easy to pat yourself on the back once you land an internship because the process itself (researching opportunities, résumé and cover letter writing, making contacts, and interviewing) can be long and arduous. But once you have made it through the glass security doors, in addition to your “official” assignments, you still have to keep your ears open, say hello to everyone, get yourself a place at meetings, and always ask questions. Thankfully, AETN was a great place to seek opportunities -- everyone was excited to talk with me and show me the ropes. After hearing two writer-producers from the A&E on-air promotions department speak at the weekly Intern Lunch and Learn series, I asked them if I could sit in on a video editing session. As a video editor, I was thrilled to see the editor-producer team at work on a Criss Angel Mindfreak promo. (And I even got to see the Goo Goo Dolls, who were filming in the studio upstairs!) I also scheduled an appointment with AETN’s human resources guru (who also heads the internship program) to discuss careers and get feedback on my résumé. It was great getting to know the kind of person who will interview -- and hopefully hire -- me one day. During my 10-week internship, I learned so much about what it’s like to work in the cable television industry and about what I like to do (and some of what I don’t like to do). After living the life of a college student, it wasn’t always easy this summer to wake up at 6:00 a.m. every weekday to catch the bus and be at work on time, but I’m definitely ready to start looking for my next internship in another five months or so, with my MetroCard and Starbucks cup in hand.